When going out, plan ahead. When in rush, the chances of falling are increased manifold. Some home health patients have weak senses and might not able to a respond quickly and appropriately. The patient should not wear clothes that drag on the floor because such garments are often the cause of trips and falls. The patient whose eyes are weak or is wearing sunglasses should remove his or her glasses when moving into lowlight area. This helps the patient to adjust his or her eyes so that a person can easily see into a relatively darker area. Thus, preventing the fall. Exercise regularly with appropriate diet would strengthen the bones and muscle tissues of the patient. This would, to some extent, retard the process of deterioration in the physical health. Junk food and carbonated drink are ill-disposed for health at this stage. Use the support regularly, especially when using staircases. Avoid going out on foot when the weather is harsh. Due to rain or snow the chances of fall are increased. Nevertheless, in case of any emergency, always use the vehicle or public transport. In case of private travel, it is better to have someone else drive your car. In bathroom, towel bars are not strong enough to prevent your fall. Therefore, it is better to install a support that is reliable enough to prevent the slippage. It is always advised to use handrails even when the patient is okay without using them. In case of carrying any material, it is imperative to have one hand on the handrails and the other for carrying the stuff. If the patient feels any sort of d izziness while walking, he should stop right at that moment and take the deep breaths. After regaining the composure, he should immediately consult the doctor. 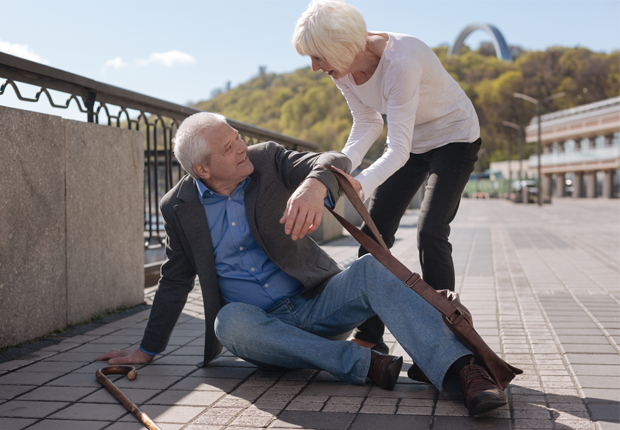 Being casual in taking medicines can cause unforeseeable problems that can be a cause of fall. Thus, there should be a proper schedule for medication.